The Shrinking Man is a Sci-fi story that is dark enough to appeal to fans of the horror genre. In the first chapter the central character, a man called Scott Carey, is sunbathing on top of the cabin of a small boat. When he opens his eyes and sees a curtain of spray heading towards him Scott’s first thought is that it must be a tidal wave. When he realizes that it is not, he still does not like the look of the strange spray and, wanting to avoid any contact with it, he rushes to get below deck. He does not make it. The spray sweeps across the boat, drenching him and causing his skin to tingle. This is when all Scott’s troubles begin. In the second chapter, Scott is being chased by a giant black widow spider and is running for his life. Except it’s not a giant spider at all. It just looks like a giant to Scott, who is now just under an inch tall and getting smaller every day. Every morning when he wakes up, Scott is exactly a seventh of an inch shorter and in six days time, he believes that he will be gone completely. The encounter with the spider occurs in Scott’s cellar, where he has spent the last five weeks of his ever-dwindling life. This was not his first encounter with the spider, nor will it be the last. Spiders are hunters. Every day in the cellar is a fight for survival and Scott is constantly running from the spider. He is also constantly running out of food. Most of The Shrinking Man is set in the cellar. The only time Scott leaves it is in his memories. In fact, one interesting thing about this book is that it can be broken down into two different kinds of segments. Chapters and heights. As an example of this, when you are a few pages into chapter two Scott manages to escape the spider and then suddenly there is the heading 68″, marking the start of a flashback scene where Scott’s wife Lou is laughing at him because he has just told her that he is shrinking and it sounds so absurd. By the end of the book the reader has got the full story about what happened to Scott: losing his job, being mistaken for a child, being beaten up by children, his rendezvous with a sideshow midget called Mrs Tom Thumb. Not to forget his time living in a doll’s house and, of course, the sad chain of events that ended up with him falling into the cellar and becoming not only trapped, but isolated from his wife and young daughter. Scott’s isolation started long before his fall into the cellar though. He might have been living in the normal world, but to a shrinking man the normal world is a very strange world indeed, Try to imagine for a moment, if you can, what it would be like to stand staring up at giant paintbrush and remember the time that you held it in your hand and painted with it. Or to look at the woman you love and have all the normal feeling that a man gets for a woman, but be unable to do anything about it, not because she has outgrown you, but because you are not the man you used to be and you cannot even manage to reach your arm around her. This is a different kind of horror from Scott’s battles with the spider, but it is still horror and it is also very sad. Staying on the subject of horror, let’s not forget that a countdown is in progress and the timer is set in sevenths of an inch. This is a hopeless situation and it affects Scott in various ways as he tries to come to terms with it: frustration, anger, fear, despair and, towards the end, a kind of grim acceptance. 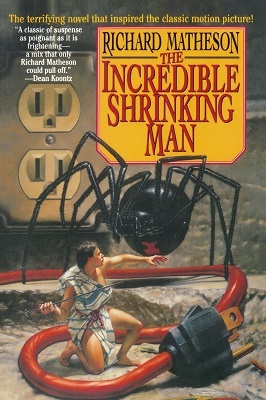 I enjoyed reading The Shrinking Man, Scott’s world is a strange one, but Matheson makes it seem believable and obviously put a lot of thought into what it would actually be like to be a shrinking man who is seeing everyday objects from a whole new perspective. A garden hose is a giant snake coiled up on the floor, a thimble is a useful device for storing drinking water, a sponge with a handkerchief over it is a bed and a spider . . . well, a spider is your worst nightmare.